I’m glad I didn’t take Levi Stahl’s advice. If I had, I would have walked away from The Getaway Car, which is “the first book by Donald E. Westlake [I’ve] ever held in [my] hands.” Not that it seems like bad advice to get my hands on some of Westlake’s actual novels — indeed, reading The Getaway Car has made me quite enthusiastic about doing that! But a book in the hand is worth many dozens in the store (even if, as turns out not to be the case, my local bookstores had any Westlake on their shelves) or at the library (especially since my local branch is currently closed). So I blithely disregarded the advice to “stop right here” and read on. A writer, in my personal lexicon, is a commercial wordsmith, an active professional, a (if the word can be stripped of overtones) hack. An author, on the other hand, is an institution, a brand name, a reputation. John D. MacDonald is a writer. Saul Bellow began as a writer but has become an institution, an author. Arthur Miller has never been anything but an author. John Steinbeck, having resisted authordom, is a writer with an honorary author’s membership card. I’m a writer, with only the teeniest and most secret and ephemeral urgings towards authorhood. . . . all of the book-length writing I’ve done under my own name has been exclusively in a category of strictly entertainment writing, in which higher aspirations, even if they existed, are irrelevant. There’s a cheerful pragmatism in this that’s refreshing in this era of heated (if largely manufactured) debates about “literary vs. genre fiction” — which is not to say that his comfortable assumption that there really are two kinds of writing, or at least two ways of approaching your writing, isn’t in its own way a potentially provocative contribution to just these debates. Now I also think you need to do a little tweaking of story procedure, how you unfold it for us. Page 52 was way too late to introduce a flashback and then let the flashback wander. You say you’re going to tell us about the first time Ben met Dana, and then you tell us a bunch of other stuff for eight pages. I am very impatient during all of this. I don’t mind leaving prison to go to court, but if I’m leaving court, by this point in the story I want to get back to prison. . . . Finally, I have one absolute objection. We do not overhear plot points. No no no. He just happens to be standing here when somebody over there says the stuff he needed to know. No. But if Ben wanted to know what was going on, and felt it was important, he could put himself at risk to deliberately eavesdrop. Almost get caught. I do want to rise to say a word or two for the semicolon. . . . My own rhythms tend to be long ones [mine too! ], and I grant you that as a result I tend to over-use the semicolon, but some of them are right, and in most instances (in this book and others) the copyeditor’s alternative is less correct. . . .Why does everybody hate the poor semicolon? It’s nice; it’s useful; it’s even rather pretty. Therefore, if I am to assume life after death, and if I am to further assume that the me over there would still be recognizably me, then I would like to meet O. Henry, Mark Twain, Ambrose Bierce and Dashiell Hammett, sit down with a bottle of beer — I won’t be on a diet then — and talk shop for a century or two. There was no strength in those gothic romances beyond the ritual, so they soon withered and died. The Western had strength, and survived, and endured, and from time to time the very ritual itself leads to art. The brevity of the early Black Mask days is long gone. The relevance of those days is gone. The vitality of novelty is gone. The reflection of an underlying truth is gone. I’m not really sure what’s left. Except the books and stories that started it all. Hammett reads as smoothly and honestly as he ever did. His contemporaries are just as lively, and not very much dated. Chandler retains his strength and his complexity. . . .
“The private eye novel may have become very strait-jacketed by ritual, but it’s certainly not dead,” he concludes. I wonder if he looked around and noticed that it was getting new life at that very moment from women writers like Sara Paretsky, Marcia Muller, and Sue Grafton. They brought a new vitality to the form because their perspective on it was novel, their underlying truth a somewhat different one. If Westlake were still around, I can imagine that it would be fun to sit down with a bottle of beer and talk this over with him. 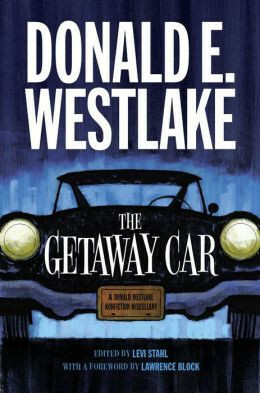 Besides making me think Westlake is a guy I’d like to have met, The Getaway Car definitely made me think I’d like to read at least some of his books (he wrote an awful lot of them!) — I’m open to suggestions about where I should start. It also reminded me that I have yet to read any Ross Macdonald or any Rex Stout. I hadn’t heard of Peter Rabe before reading Westlake’s essay, but he made me curious (“Peter Rabe wrote the best books with the worst titles of anybody I can think of”). His “Ten Most Wanted” list is mostly books I haven’t read or hadn’t heard of, in fact, which is a bit discouraging considering how much time I spend reading, reading about, or talking about crime fiction. Also, why have I never read Thurber’s “The Man Who Knew Too Little”? I start my class every year now with “The Macbeth Murder Mystery,” but a little more Thurber can only be a good thing. Just what I needed: more books to read! I’m glad I already read The Getaway Car, though, even if by some lights I should have deferred it. Many thanks to its editor Levi Stahl for my copy of it: congratulations on turning your obvious enthusiasm into something tangible that you can share with the rest of us. Mysteries, Stahl, Levi, Westlake, Donald E.
You HAVENT READ Rex Stout? You haven’t … You haven’t read… I mean, you MUST have meant to say you haven’t read ALL of Rex Stout, right? Yes, that must be what you meant. *whew*! Where, oh where, could I ever obtain any of these delightful books, which are as scarce on the shelves of my local bookstores as Westlake’s own? This sounds fascinating! But can my TBR pile/list take any newcomers? I know how you feel. The more you read, the more you realize you haven’t read — unless you’re Steve Donoghue, of course. Oh, so glad you enjoyed the book, Rohan! Happy to provide suggestions for where to start with other Westlake any time. I haven’t read Rex Stout either. And I got no good excuse. Where should I start? With Rex Stout, you can almost start anywhere: there’s some carryover throughout the series, but the books are mostly self-contained, and each one gives you enough sense of the overall set-up of characters and situation that you can dive right in. I started, by chance, with the first one, Some Buried Caesar, and it was fine as a starting point; some particular favorites are The League of Frightened Men, Too Many Cooks, The Father Hunt, and Gambit. If you like one, you’ll probably like them all–and there are so many! Duly noted here as well. Isn’t Fer-De–Lance (the only Stout I’ve read) the first of the Nero Wolfe books? I’m sorry–you’re right, Bill: I got turned around. Fer-de-Lance is the one I had in mind, and it would definitely be a better starting point than Some Buried Caesar, which is atypical if for no other reason than that Wolfe leaves the building–and stays out! • Dancing Aztecs. Top of the list for me. It’s a scavenger hunt, it’s a romance, it’s a romp, it’s social commentary, it’s a ton of fun. 16 plaster knockoffs of an Aztec statue, but one of them is the real thing. And everybody’s looking for it all over greater New York, with shifts of point of view (and of authorial voice) every few pages. • God Save the Mark. A quick fun tale narrated by the “mark” — a man who falls for any con that anybody tries to pull on him. If you want more, I’ve got more.